Although the KTM Strada 1000 CD sneaks in under the £1,000 threshold, its looks like a top-dollar package. There are striking graphics, smooth welds, and trick little details like an anodised blue stem top cap and seatpost clamp and colour-matched Selle Italia saddle. Of course black, white and blue are the ‘now’ colours in the pro peloton. The Shimano Tiagra spec is on the money too, and like it or not, the Ritchey finishing kit has more pulling power than own brand. The Strada 1000 is a well proportioned bike, with classic semi-compact geometry, a wheelbase that allows a bit of ‘give’ and a head tube that is reasonably tall, although our test bike came with the steerer cut shorter than most. The smooth welds and paint are very nicely done. There’s no tapered head tube but that’s not essential at this level. A great shifting but slightly rattly Shimano Tiagra groupset is fitted in its entirety right down to the brake calipers. In many senses it’s all riders at this kind of level will need, although the little windows on the shifter telling you what gear you’re in are unnecessary — maybe that’s even where the rattle originates. The dual-colour KTM bar tape is a pro touch. In fact, there’s carefully considered detail wherever you look. We might have issues with the Shimano R501s on a bike that costs £300 more but at £929 they are par for the course. 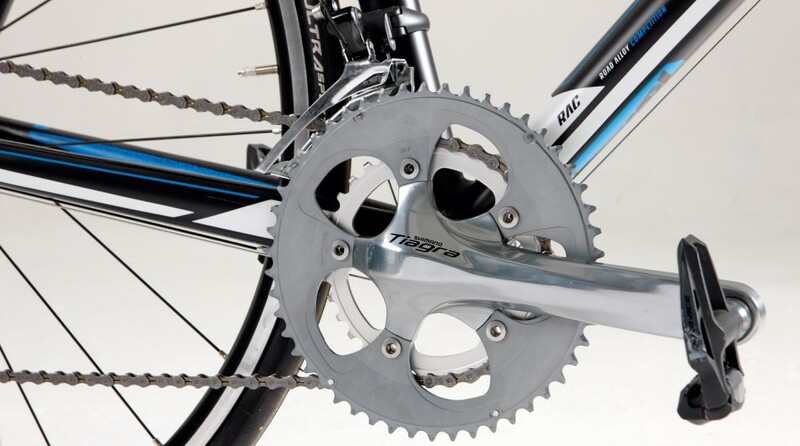 They’re not particularly light or aero — the spokes are not bladed — these are nevertheless fit for purpose and you can work on the bearings yourself, and even true them if you know what you’re doing. The KTM doesn’t quite have either absolute class-leading refinement or all-out aggression, but it manages to blend elements of both very well indeed. It is easily stiff enough to resist the pedalling forces that steep climbs and accelerations demand, and has enough comfort factored in to make easier, longer rides thoroughly enjoyable. Steering is just right — not too twitchy, not too slow. Of course, position on a bike is a very personal thing, but we also found it very easy to find a comfortable position on the Strada 1000. That tall head tube should suit sportive and leisure riders very nicely. In fact, it’s hard to fault the KTM. Despite its very affordable price it really has a lot of class, starting with its impressive appearance both from a distance and close up. Allied to that top quality finish is a nicely-balanced geometry, a very stable temperament that doesn’t veer too far in either direction, and some nice details, and you’ve got an excellent sub-£1,000 all-round road bike. The sub-£1,000 aluminium road bike market is a fiercely fought arena, but the KTM Strada 1000 is a good enough package to challenge anyone. It’s a quick, comfy, and a very classy package.